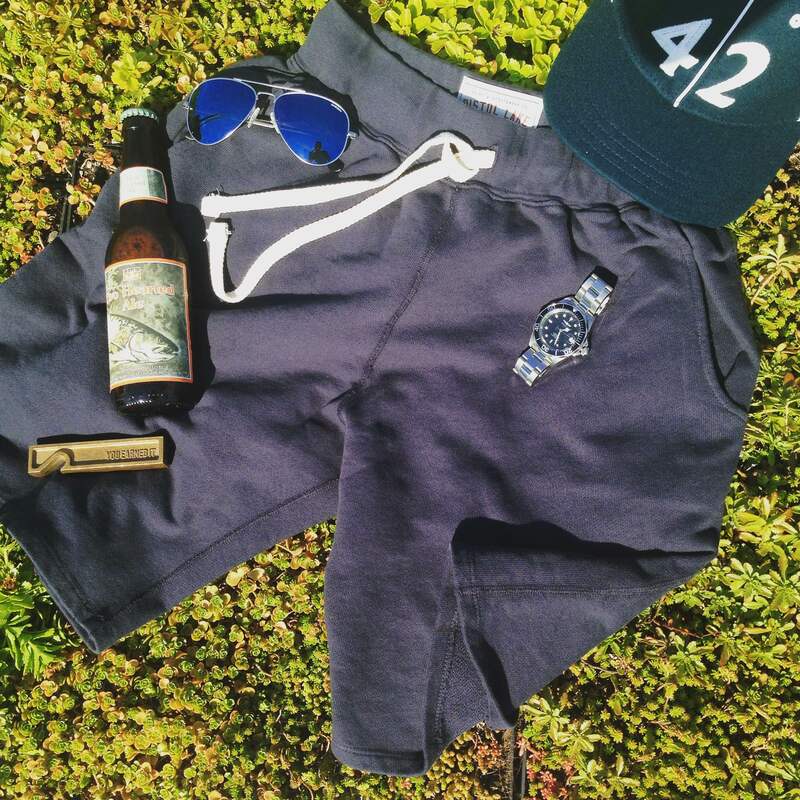 August 31, 2015 by Beau H.
Perhaps the best representation of the kind of gear you should have on-hand for the weekend. French Terry Sweatshorts by Pistol Lake. Stainless steel dive watch by Invicta. Sunglasses by Randolph Engineering. Vintage ballcap by Goorin Brothers. Brass bottle opener by Owen & Fred. Two-Hearted Ale by Bell’s Brewing. Well folks, it’s almost upon us. The de facto end of summer — Labor Day. That means fall style is well on its way (including an updated 2015 Fall Style Wish List), which is quite exciting as far as the potential it brings for layering and new outfit combinations. However, that also means there’s one last chance to bust out some casual, long weekend summer style. Whether you’re hitting the beach, the pool or a backyard barbeque, you can’t go wrong with trying to look your best — ya dig? Take a look at the below suggestion and feel free to share what you’ll be wearing when the time comes! The perfect shirt for a laidback weekend. Dark denim by Mott & Bow. Stainless steel dive watch by Invicta. Glasses by Warby Parker. 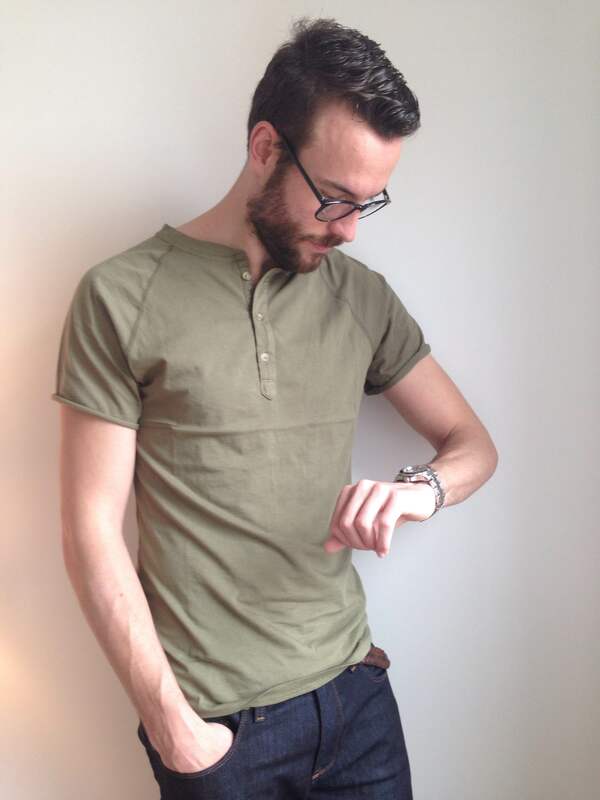 So this henley keeps popping up on this blog time and again, but for extremely good reason (see a rundown of other great henleys here). It’s the ultimate masculine style piece for warmer weather, what with its athletic cut, unfinished sleeves (giving it a vintage look) and a worn-in vibe that perfectly complements a casual weekend fit for a barbeque or some time at the beach. If the occasion does call for something dressier, you could throw on a crisp polo instead. Any of the brand’s neutral colors would work well for this henley, but the Relic White or Quartermaster options are particularly versatile. On the left: A sporty pair of sweatshorts that allow for flexibility and casual style. On the right: Cheap swim trunks that can easily be replaced. Why the two different options listed? Well, let’s say you don’t happen to be at the water but still want to look good — not too dressed up or dressed down. A French Terry sweatshort (as seen on GearHungry) allows you the flexibility to move around and play some backyard football, say, yet it’s an upgrade over baggy cargo shorts or athletic shrots. Some lightweight shorts in a neutral color (like any of the options seen here) could stand in as well. The swim trunks, on the other hand, are the type of thing that could be a quick pick-up if you need a replacement pair of trunks — or just a pair in general. And at that price, they can very easily be replaced when swimming season rolls around again (for those of us in colder climes). A sneaker-boat shoe hybrid from a brand that does boat shoes the best. Unlike the swim trunks listed above, $90 is actually quite a bit of an investment to make for a canvas boat shoe at this point in the summer. But if you don’t mind hanging on to them until spring rolls around again, then these could be a good pick-up from a well-known brand. 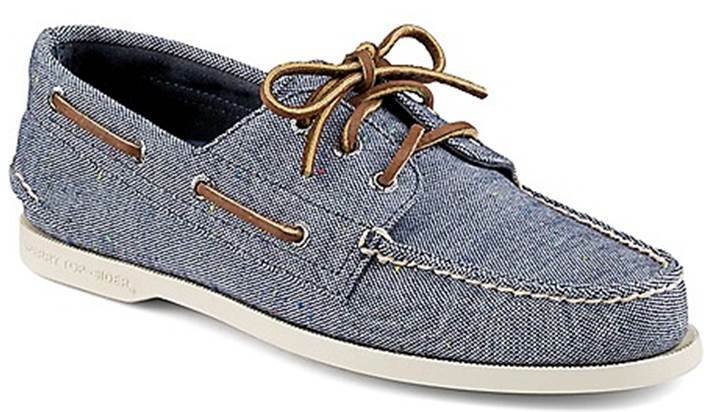 Boat shoes haven’t gotten a ton of airplay on this blog, but the style would blend in better with swim trunks than a pair of classic sneakers — although if you go the sportier route and opt for something like sweatshorts, crisp white sneakers certainly wouldn’t be amiss. And with either option, you could opt to go barefoot or grab some Richer Poorer no-show socks that do a nice job staying put. The Stuhrling Aquadiver Manta Ray watch. This watch, like some of the other items here, has indeed been featured on this blog quite a bit (read the original review here). But, there might not be a better (or quicker-shipping via Amazon) rubber strap watch out there. It again meshes with the sporty-casual vibes of this outfit and looks particularly rugged when paired with swim trunks (James Bond wears a rubber strap watch in Casino Royale, as you might recall). Other tough-casual options are out there as well — the Timex Cordura Ripstop watch (a new release this summer), which adds a bit of sheen with a blue dial. Subbing in a NATO watch strap with some pattern also could work if you already have a preferred casual watch. A retro frame shape and color make these one heck of a pair of shades for the price. Under $15? For a J. Crew (well, close enough) pair of sunglasses? That’s a downright steal, and plays into the notion of grabbing something on the cheap for the weekend. That way, you won’t feel bad should they break or get stepped on. This pair in particular combines a retro-looking square lens shape with an equally retro gold frame for some pretty neat style. If buying goods made to last is more your thing, the Concorde Flash Lens series from Randolph Engineering hits the mark for a pair that’s made in America and exceptionally solid. If you want even more retro flair however, J. 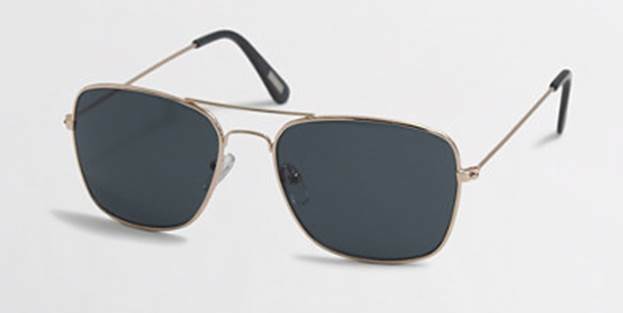 Crew Factory also offers a pair of Clubmaster-inspired frames for a low price. Of course, if the situation does call for an overall dressier look, throwing on some slim chinos should dress up that henley (or polo) nicely. And if you are hitting the road, make sure you prepped to do so in style with these great men’s travel essentials. Above all though — enjoy this last hurrah (or perhaps the first of many fall …. hurrahs?) and do so in style! What are your thoughts on the above outfit suggestion? What pieces would you change or swap out? August 29, 2015 by Beau H.
Sticking with a polo right through the end of summer. Hopefully, there’s not too much off about this week’s Style Pick — a polo? Right at the end of “summer” for a lot of us? Yes, of course. Here’s why — there’s still plenty of time to wear that polo on its own, then layered up under some more unique combinations, like henleys or casual sweaters, in the weeks thereafter. Of course, you’ll then have a newer polo in your rotation come spring as well (if that’s even an issue). And the more casual the fabric and texture, the more the polo might wear like a T-shirt, anyways. That’s what the Slub Nep Jersey Polo from Grayers accomplishes. It combines a textured nep yarn and a just-right three-button collar for a polo that could even work under a blazer (provided you’re equipped with some collar stays). Grayers has got a lot going for it in terms of styles that walk the line between continental and preppy, so it only makes sense that a polo from the brand would blur those lines, too. 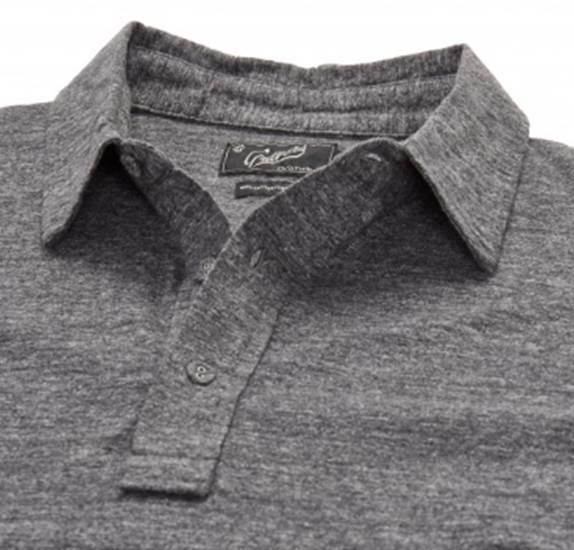 One of three color options for this style of soft-knit polo. And in a slightly heightened shade of blue when compared to a deeper navy, it can be styled in the exact same ways as the classic color while bringing a bit of pop. After all, a navy polo is a style stalwart that can be dressed up or down — check out my Effortless Gent series for more suggestions. If you’re on the hunt for a slightly different color, a Light Blue Denim option is available on the Grayers website, as is a Charcoal polo that could pull double-duty with earthy olive chinos well into fall. Prices are up there when you stack it up next to something like an H&M polo, but you get a reliably classic option that should offer a modern fit and well-made fabric. Even if summer’s almost over, that’s still a pretty good buy. Do you own any Grayers product? 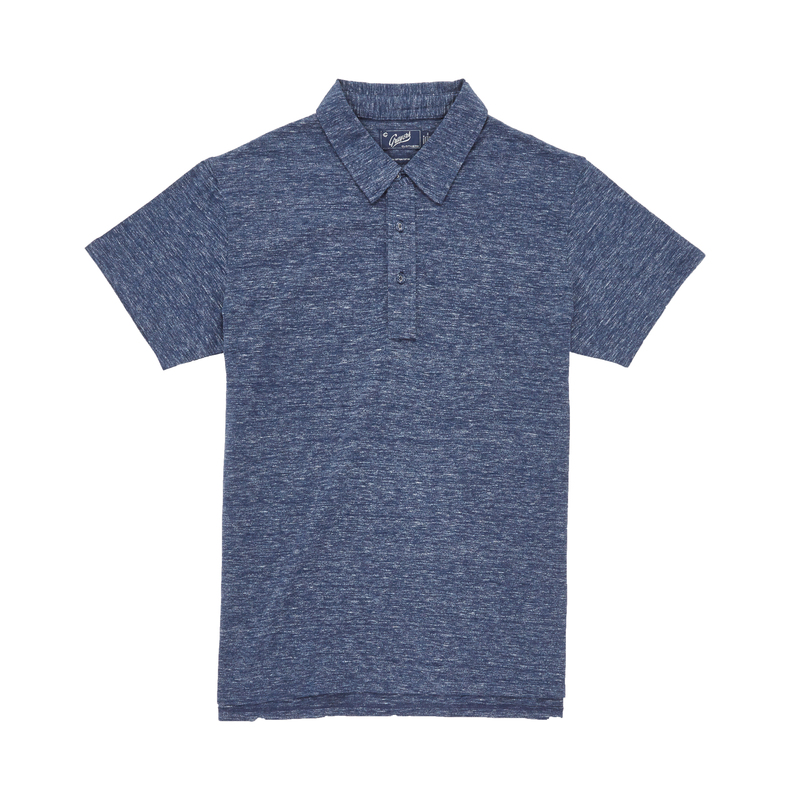 How would you style this polo into the fall for maximum versatility? August 28, 2015 August 27, 2015 by Beau H.
It’s been quite the wild week around these parts. Last night, I had the great fortune to attend a Fall 2015 collections preview courtesy of Wolverine at the brand’s excellent Wolverine Company Store on NYC’s quaint Elizabeth Street, put on in conjunction with women’s style blogger Rachel-Marie Iwanyszyn of Jag Lever. It was a great collection, full of refined takes on rugged style staples and an excellent evening catching up with some blogger friends and industry colleagues while enjoying complimentary whiskey and some tasty appetizers, too (check out more at my Twitter here). It proved a bit more tiring than usual to make it to that event, as the night before (Wednesday on the calendar), I fulfilled a dream about seven years in the making — seeing AC/DC live (again). It surprises most folks to know they’re one of my favorite bands — but they really are something else (I swear you can hear me yelling in this video of the standout title track “Rock or Bust” as they opened the show). They put on an electrifying show at MetLife Stadium in East Rutherford, N.J., and thankfully, my ride home was taken care of via party bus. So that made for a whirlwind end to the week! And now, the weekend’s here. Get a start on some much-needed relaxation by catching up on all the hits from the week — including a dose of rock n’roll. The style crew at Dappered rounds up 10 watches worth your time (pun intended), and they all clock in at under $100 — a downright steal. I’m a big personal fan of the Invicta Automatic Diver (also known as the 8926 model) and featured here. While we’re talking rock n’roll, Rolling Stone delivered a glowing review of the show that preceded the standout concert I saw in New Jersey — the opening of the North American leg of the Rock or Bust World Tour last weekend in Massachusetts. Getting back to the style front, Esquire sent famed fashion director Nick Sullivan into the heartland of America with a simple mission — come back with two outfits for under $200, shopping at only vintage or thrift stores and the like. Long Read of the Week: Sticking with more content from Esquire, writer Tom Chiarella spent four days traversing the streets of Chicago wearing four distinctly different uniforms and chronicled the reactions of people he encountered. Pretty fascinating read as it relates to the idea of, quite literally, adhering to a personal uniform. That’s all for this corner of the Internet; here’s more on the style front elsewhere though. Heritage bagmaker Satchel & Page recently added to its lineup of stellar high-quality leather goods with a run of belts funded through Kickstarter — I covered the campaign here for VOUCH Mag. Get caught up on what you might be missing from elsewhere in the world of #menswear with returning guest author Mark Lai’s post on the men’s dress footwear scene in Malaysia. August 26, 2015 August 26, 2015 by Beau H.
Editor’s note: The world of style is remarkably vast, to put it mildly. It seems no matter where you go, great brands and great finds abound. Returning guest author Mark Lai spent some time globetrotting this summer [much like your humble author] and delivered this dispatch from Malaysia — yes, Malaysia — where shoe fiends who delve deep into the menswear world will feel right at home. Follow him on Instagram to keep up with his style adventures. A brief peek at what was to come at P. Lal in Kuala Lumpur. As far as quality shoe brands are concerned, Singapore is largely a barren wasteland. While establishments like Ed Et Al, Carmina and Septíème Largeur have opened in recent years, the majority of Singapore’s shoe landscape is still dominated by the likes of Hush Puppies and Ecco. There remains a dearth of choice for quality shoes at specific price ranges -for instance, Ed Et Al is the most budget-friendly option, with prices for their (excellent) ready-to-wear pieces starting around $350. [Editor’s note: Check out other budget-friendly dress shoe options here]. P. Lal in most of its shoe-envy glory. Fortunately, there remains a veritable perk of residing in Singapore: Kuala Lumpur, home to P.Lal, is a mere 5 hours’ drive away. 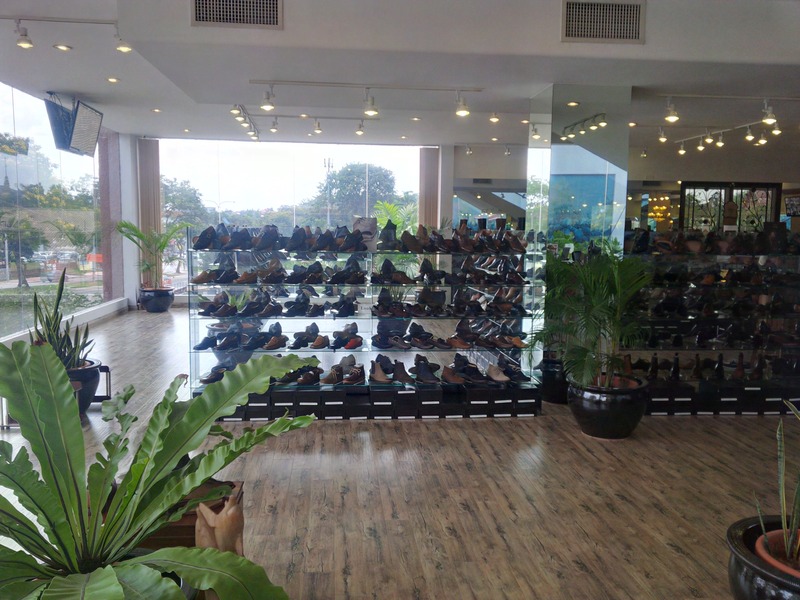 For those unfamiliar with it, P.Lal is a family-owned shoe store located on the outskirts of Kuala Lumpur in the Petaling Jaya district, and has been in operation since 1929. The brands stocked, with their respective pricing points indicated in the brackets, include a range (detailed below) from entry-level to drool-worthy, with a focus on European heritage shoemakers. 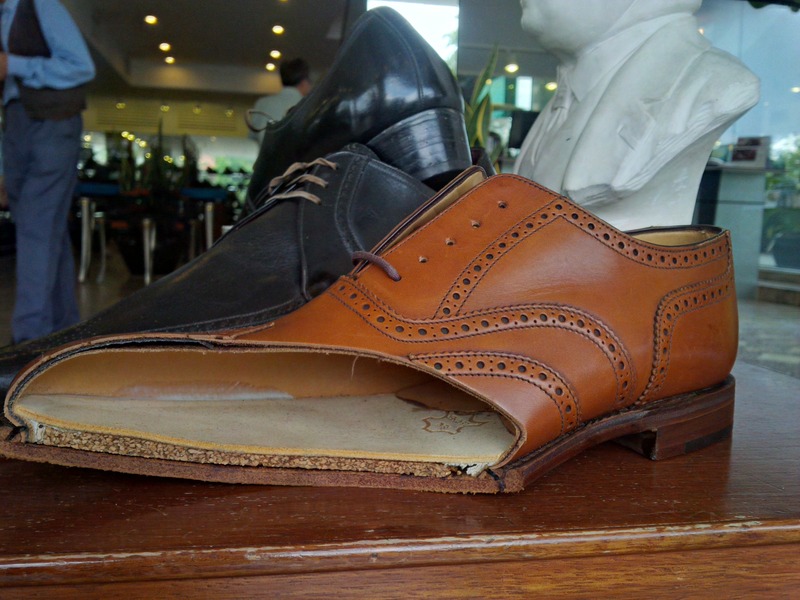 A good look at the anatomy of a Goodyear-welted shoe by Loake. 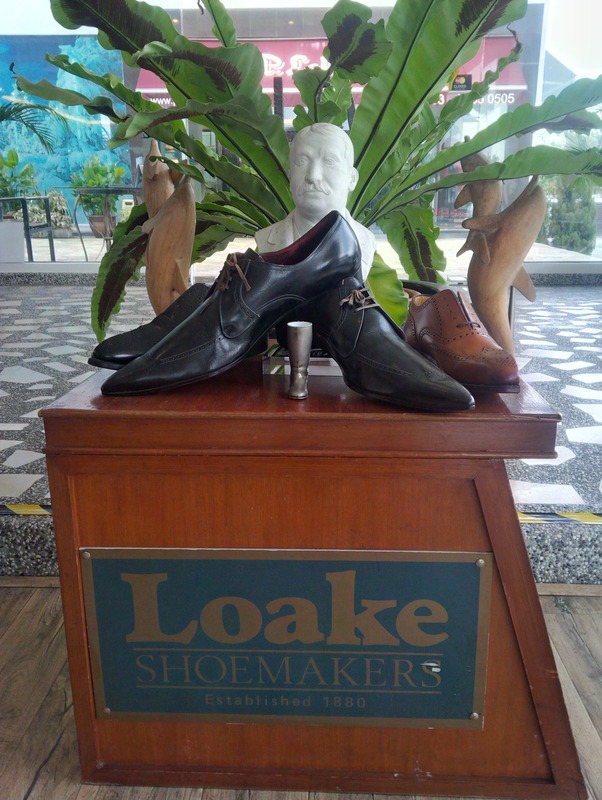 P. Lal claims to have the largest collection of Loake shoes in the world. Although I’m in no position to verify that, it may well be true since they stock most of the models from all of Loake’s ranges – Loake 1880s, Loake Shoemakers, Loake Evolution, design Loake and L1. (Editor’s note: You might recognize these guys Stateside, as they’re sold via East Dane). I confess that I didn’t have a good look at the models from Barker while I was there, largely because I was in the market for a pair of Loakes, and because I saw a few cemented (referring to the method of attaching the soles of the shoes to their uppers) and corrected grain models, which I wasn’t quite fond of. In addition to their main collection of Cheaney’s, it’s also worth noting that P.Lal has factory seconds of Cheaney’s shoes, albeit in limited sizes and models. At prices similar to or lower than Loake 1880s, these seconds are an incredible deal, provided you can find one in your size. Crockett & Jones (Mid-range) [Editor’s note: Another brand with a recognizable name — they supply boots to none other than James Bond]. It’s quite a pity that Crockett & Jones stopped supplying to P.Lal some years ago, ostensibly due to their overly-low prices that Crockett & Jones weren’t agreeable with. A few sizes remain. At prices starting from about $730 or so, shoes from Gaziano & Girling remain firmly in my personal “see but don’t touch” category for the time being. Fine, I might have touched them ever so briefly, but that limited touching was rudely interrupted by the drool leaking uncontrollably out of my mouth, induced by the elegance of those beautiful lasts, channeled soles and fiddleback waists. More Loake shoes on display at this veritable shoe lover’s dream. I found shopping at P.Lal to be a blissfully serene experience. Unlike most other shops, I was able to walk around the shop at my complete leisure, without the pressure of having a sticky sales associate pushing products onto me. (When engaged however, the sales associates were extremely attentive and knowledgeable, giving me advice on the lasts which would fit my wide-ish feet.) That lack of pressure resulted in me spending two-and-a-half hours asking a ton of questions, trying on multiple sizes in various models, walking around the shop in the shoes I was trying and gazing lovingly at the display shoes as if they were museum exhibits. Left in my trail were two exhausted sales associates, a companion who had mentally checked out long ago and many shoe boxes. In addition to the wide array of shoes and the wonderful shopping experience, the favorably low value of the Malaysian Ringgit compared to U.S. dollars and P.Lal’s lowest fixed prices guarantee provide two more compelling reasons to drop in for a visit if you’re ever in town. August 24, 2015 by Beau H.
Your chance to win a well-made grooming product from an upstart brand. Photo courtesy of Kent & Bond. Editor’s note: Read on (or at least skim?) to the bottom of this article for a special reader giveaway opportunity! It seems lots of companies in every facet of the menswear landscape are now paying more attention to how they make their wares — that goes for the consumers buying them, too. Whether it’s Everlane’s model of radical transparency or brands like Noble Denim supporting American-made manufacturing, the trend (if you want to call it that), is everywhere. It hasn’t been all that loud on the men’s grooming front though — particularly when you combine the qualities that seem to separate most grooming brands: domestic manufacturing and organic ingredients. Kent & Bond is changing that, though. I had the chance to write about the brand for VOUCH Mag and I also got the opportunity to check out its signature Body Brick soap across these past few weeks. Launched last year and the proud owner of a new E-commerce website, its product is made in the U.S.A using Certified Organic ingredients. Those touches give the product a premium feel for a low price — $14 for a fairly substantial mini-brick of soap, among other nicely priced wares (read on for more on those). 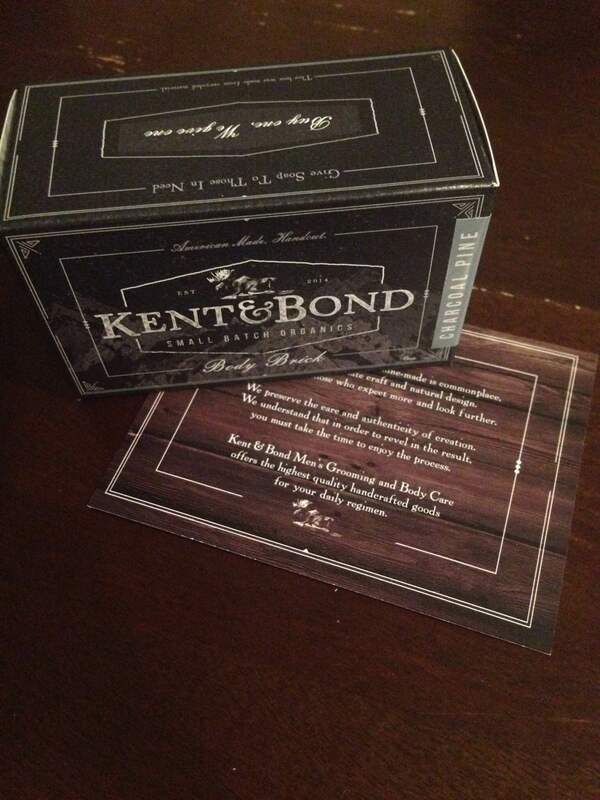 Kent & Bond’s Charcoal Pine Body Brick, complete with the brand’s mission. I was admittedly skeptical at first about the product — it’s just a bar of soap, right? Is there a catch? Honestly — no, no catch at all. I sampled the Charcoal Pine Body Brick (as charcoal-based products seem to be everywhere in the men’s grooming world these days), and I haven’t been disappointed. The bar combines a pleasant smell with a crisp, clean feeling — and that’s also reflected in some of the other Body Brick samples I was sent (the brand stocks five Body Brick scents in total). The bars are also rich in vitamins, aged for three months and produced in small batches — tough to find that in your average body wash. It’s also worth nothing that the brand produces responsibly made body gels, too. 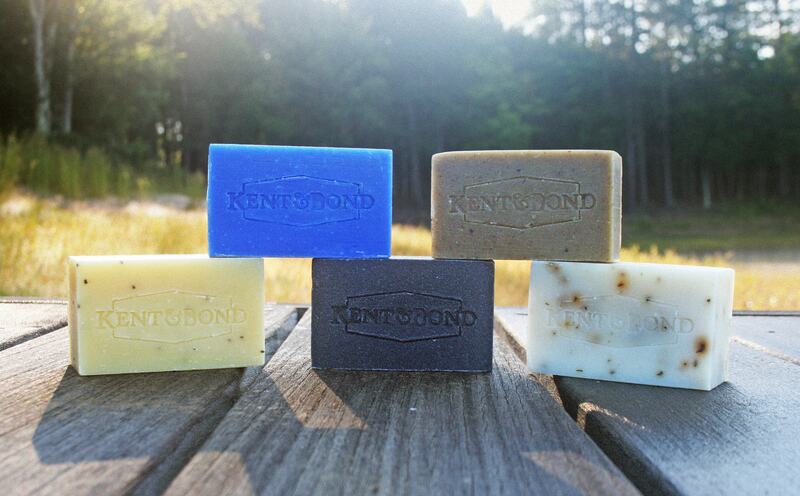 The full run of the brand’s popular Body Brick soaps. Photo courtesy of Kent & Bond. Head on over to my Instagram account, [make sure you’re following myself and Kent & Bond, of course!]. Then, ‘Like’ either Sunday or Monday’s special K&B-themed IG post and comment as to what product or scent you’d like the best! You’ll be able to tell which is which based on the post, trust me. The winners will be chosen randomly and notified late Tuesday via Instagram. Stay tuned for more! And head over to the brand’s Facebook or Twitter accounts for more from their world. August 22, 2015 August 20, 2015 by Beau H.
The latest release from Gustin — a shockingly affordable and stunning boot made right in America. The folks over at San Franciso-based Gustin have been on something of a tear in recent months — the brand released its first pocket T-shirt earlier this spring, and if it wasn’t enough to deliver well-crafted basics on top of excellent everyday wear, the brand then put out some stunning sneakers this summer. Those releases were the cherry on top of its already standout line of durable and well-crafted denim and complementary pieces like chore coats. And each item funded quickly as per the brand’s crowdsourced production model. Consider Gustin one step further into completely dominating your wardrobe now, thanks to the release this week of a lineup of made-in-America boots that look positively outstanding. If the speed at which they’re funding is astonishing, the price point is nothing short of jaw-dropping, too — just $199. 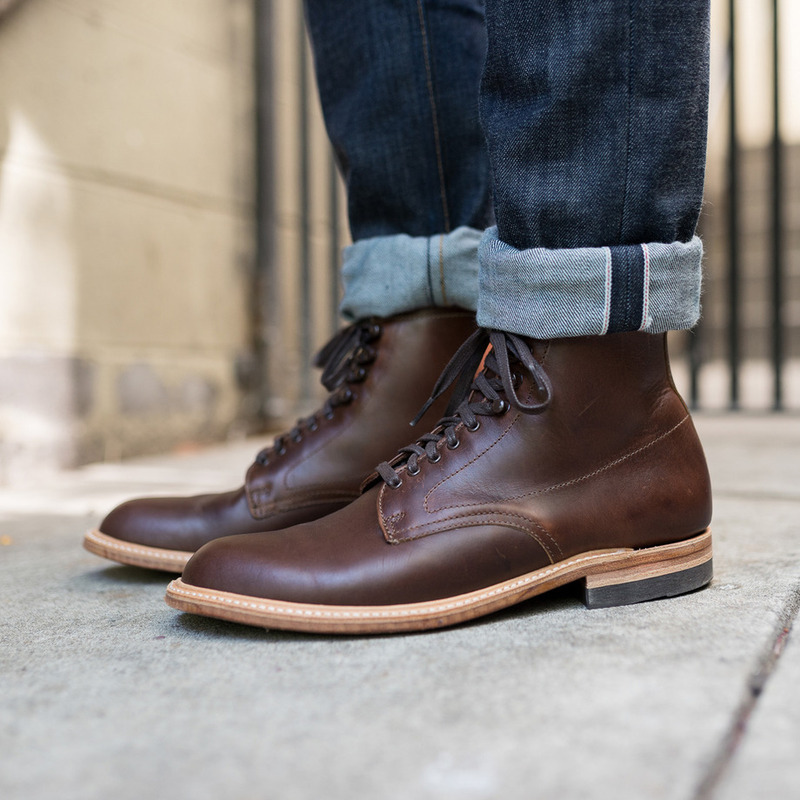 That’s a good chunk less compared to similar-looking boots from Wolverine or Red Wing, for starters, yet they’re made by the very same craftsmen. The Inferno Tan shade brings heavy vintage vibes, an eyecatching color and a heck of a price point. Gustin’s boots are available in three different looks, ranging from the chocolate brown shade seen at the top to a bright shade of tan and a grey-and-gold tinged Natural color. The specs of the boots are equally impressive, particularly for a pair that retails at what’s normally a final sale price for other brands. 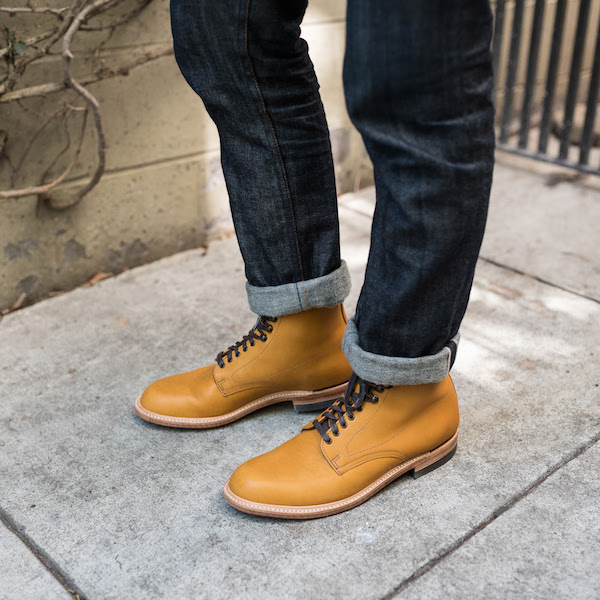 Built to last with Chromexcel leather from the world-renowned Horween Leather Company, they feature a tough Goodyear welt. The brand even used a custom last to create a pleasing, slim-yet-rugged profile that should pair well with its dark denim — and particularly rough-and-tumble fabrics like herringbone and tweed come fall. The waxed brown laces and brown metal eyelets on the CXL Brown Classic Boot are the kind of details that make these both a boot that can take a beating and a boot that’ll look all kinds of right when worn with dressier cold-weather essentials — is it fall already? Will you be funding Gustin’s latest release? How would you style the boots seen here?